Manchester United are to hold a service at Old Trafford marking 60 years since the Munich air crash which killed most of the Busby Babes. The club is sending invites to season ticket holders over 65 but said all supporters will be welcome. Turnstiles will open at 13:45 GMT on 6 February for an event with readings and poems, beginning at 14:45. A minute's silence will be held at 15:04, marking the time of the fatal plane crash. 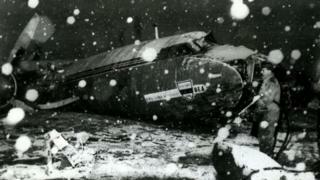 Twenty-three people were killed in the disaster, including eight United players and three club officials. Seven of the players were killed immediately in the crash, with the club's rising star Duncan Edwards dying 15 days later in hospital. Club legend Sir Bobby Charlton, who was 20 at the time, suffered head injuries in the crash while manager Sir Matt Busby was so badly hurt he was given the last rites by a Roman Catholic priest. Among the journalists killed in the crash was Frank Swift, the former Manchester City and England goalkeeper. Busby's team, nicknamed the Busby Babes, were in unstoppable form that season with journalists speculating that they might have won a treble of the FA Cup, Division One title and the European Cup. The United party were returning from a European Cup match at Red Star Belgrade. The club will also hold a minute's silence before the Premier League home game against Huddersfield on 3 February. Fans will be invited to pay their respects from 13:30 GMT on that day under the Munich plaque at the south-east corner of Old Trafford.